Could post-arousal CAs sometimes cause more arousals which in turn cause more post-arousal CAs causing more arousals, etc? All right, I could keep the same settings for tonight. The first night at 5/13/4 while pretty broken had very few CAs. Would that or 6/13/4 possibly cause less CAs than fixed pressures? 11:05:20 short leak before the CA - I don't remember adjusting my mask last night, but I remember tossing and turning in bed. I also haven't gotten any dry mouth lately. Maybe the collar helps with that or I don't mouth breath as much. I'm trying to look up how to manage LPR. It only started developing when I started this thread. I'm going to see a doctor about this. Also, would a lower EPAP help decrease triggering LPR symptoms? EPAP: From what you've posted so far EPAP=5 is too low and EPAP=6 is borderline handling the OAs while EPAP=8 seems OK.
IPAP: PS =4 deals great with your flow limitations, why IPAP should go any higher than EPAP+PS=11 or 12 ? If you really want to lower the pressure, try 11/7/4 instead 12/8/4. Sleepover: I've used Afrin before but heard stories about dependence and rebound congestion. Can you actually safely use it every night with no bad repercussions? Or should you only use it a few times every week? I'll go get some tomorrow to see if it makes a difference. Not stories. Recommended usage is 3 days only. Otherwise can be counter productive with rebound, addiction, worsening of symptons, etc. There are safer ways to clear the nasal passage longer term such as nasal washes, neti pot, flonase, nasonex, etc. The only thing that's amazing is how f****** disturbed my sleep is and how hopeless this all seems. Sleep hygiene does f*** all for how often and when I'd awake as evident in Day 5. I don't have much anxiety about going to bed or awaking at night because I know I'll eventually fall back asleep. I make sure not to go to bed until I feel sleepy and I'd get out of bed as soon as I feel like I wasn't going to go back to sleep after 20 minutes or so. Last night, Day 5, my sleep hygiene was actually good as I just sat there in complete darkness for over 2 hours until I got sleepy, but I awoke so many times early into therapy and through it all. I don't look at the clock all the time whenever I woke up, but I remember it because it's so traumatic. Even with Dexedrine, this fatigue is simply overwhelming. My brain is just whittling down to dust. It feels like I age months every night. I'm fully disabled and incapacitated by this. How much longer can I last? What's the point in trying. Too many awakenings to count, I don't even remember when. I just took screenshots of every possible RERA and SDB-related events. Which ones look spontaneous or normal and which ones look breathing related? Same as above but with going dark over 2 hours before bedtime, many awakenings again but with a even more prolonged one partly due to delayed painful aerophagia. Also, there is no way I can maintain a proper sleep schedule when the awakenings are so frequent, prolonged, and chaotic. Two days of trial left with the bilevel. What next? (06-15-2018, 05:28 AM)jmjm28 Wrote: Sleepover: I've used Afrin before but heard stories about dependence and rebound congestion. Can you actually safely use it every night with no bad repercussions? Or should you only use it a few times every week? I'll go get some tomorrow to see if it makes a difference. Thanks, Jim. I use flonase, it doesn't really help at night. I also read that neti pot is not safe to use frequently. I did not read all the posts. Please point to data where you set the minimum to ~15. (06-16-2018, 10:05 PM)tedvpap Wrote: I did not read all the posts. Please point to data where you set the minimum to ~15. I don't have any nights with a min pressure any where near that but I'll show you what my highest nights look like. Dexedrine was prescribed for ADHD? Is the prescribing doctor aware of your persistent insomania? (06-16-2018, 08:24 PM)sleeplover69 Wrote: What next? Call the respiratory issue done and focus on non-respiratory aspects of sleep and health. Nah, I take like 1.25mg to 2.5 mg dexedrine only like a few times a month. Today was the first time this month I took it. Some ADHD doctors actually recommend patients take very low doses to help them sleep at night. You didn't see catch anything peculiar with the last two days of data? I know it was a lot of screen shots. I think 8/12/4, even 7/12/4 have too high epap. Centrals are still far too high with both. Going to try to lower epap while keeping similar ipap. Going to see if I can get ahold of an ASV, too. Also seeing an ENT to see what he can do about the nasal congestion. I had looked at the graphs. At test day 5, 5:56:0, 6:09:25, 6:11:35, 6:17:15, 6:37:25,...many more... looks post arousal where you first woke up, had recovery breaths and no need to breath after. 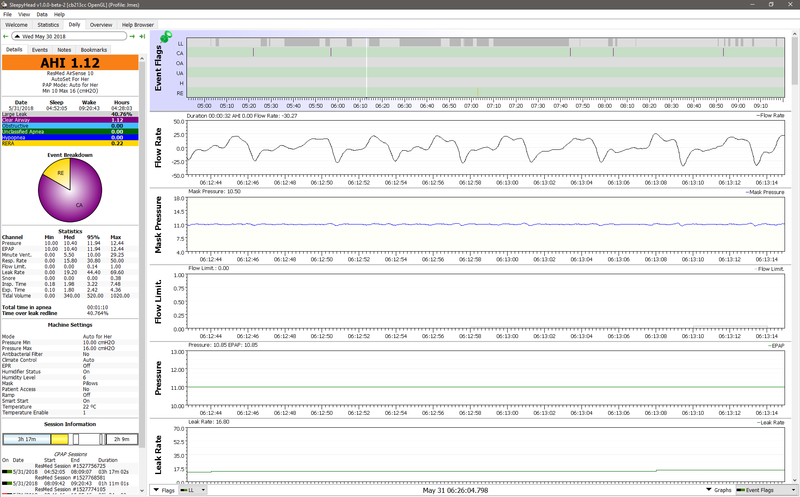 Without additional data channels available in a sleep lab we really can't know what is going on. so some of your arousals were preceded by respiratory difficulties while most were not so they marked them as spontaneous. Now, preceding on an assumption the sleep lab did not properly diagnose UARS (as not all of them do) and the fact the waveform did look "weak", you had trialled bi-level. The bi-level did get your flow limitation to zero and fixed the waveform but did not help much with spontaneous arousals. The likely conclusion is the sleep lab is correct: that you have spontaneous arousals that are not respiratory related and thus will not be fixed by air pressure. With lower EPAP, watch for OAs. You surely had them with EPAP=5. I would not go any lower than 6. ASV - if you can trial, go for it. If it works great and if not you will know for sure you had tried all possible solutions in the "air pressure" avenue and it's time to go in other directions.